Gwyneth has a real passion for working creatively with young people (she wrote a piece on the subject for the Southbank festival in 2015) and is an experienced leader of bespoke songwriting, singing and creative devising workshops, having worked with schools, colleges and community organisations across the UK and on three continents (see bottom of page for references). In her own creative practise she is always looking for new ways to engage with people; by tying in these workshops with her touring schedule Gwyneth is able to reach out into the communities she performs in, and, by inviting them to perform with her, give young people the opportunity to have their creative voices heard. 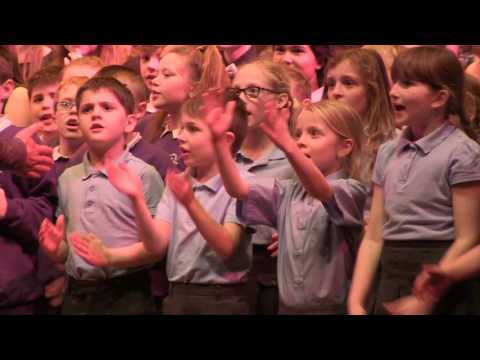 Here is Gwyneth conducting a choir of around 300 young people, put together from several schools and with whom she rehearsed earlier that day, in a piece she wrote especially as the finale of the Celebration of Schools’ Music concerts at Snape Maltings Concert Hall. … and in 2014 she led creative workshops with young people across East London as part of her and artist Mel Brimfield‘s interdisciplinary work The Palace that Joan Built (also involving a LADA-commissioned workshop at the National Theatre Studio). These fed directly into her songwriting for the project, which was brought to life in a performance to an estimated 58,000 people at Stratford Underground Station.